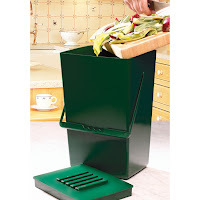 I've been meaning to get one of these compost caddies for ages but living in a shared house brings issues when you tell your flat mates that you have the desire keep your peelings! Well - bugger em. I'm keeping my crap and I'm going to make nice rotten goo-ey stuff with it! 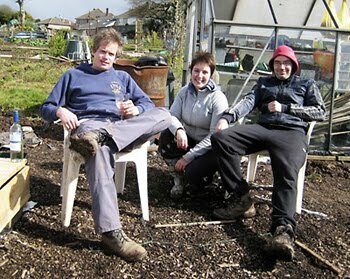 Dave got his from Lakeland Limited (the tall green one) for £5. It comes with a filter and a very tight finger slotting system on the handle. My hands fit perfectly but my hands are pretty small tho! 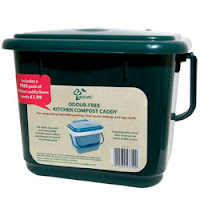 The second caddy is a short, fat one that has a clip lid. It's not too exciting and it's the same type that (if you're lucky enough) your council will deliver for you. Cardiff council is not particularly good at 'environmental' issues so we get nowt. The short caddy costs £3.99 from B&Q.